For Her Eau de Toilette Delicate is a bright and captivating fragrance, with an opalescent shimmer. Deliciously addictive fig notes replace the osmanthus notes of the original Eau de Toilette, bringing freshness to the fragrance. 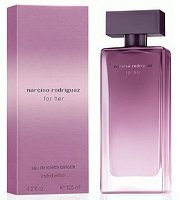 Narciso Rodriguez For Her Eau de Toilette Delicate is available in 75 and 125 ml Eau de Toilette; the larger size can be found now at Saks Fifth Avenue for $102. The original NR for Her edt wears pretty delicately on me as it is, but I’d still try this since the fig note sounds intriguing. Sephora has another NR flanker, For Her In Color and there’s also an Essence In Color that I know nothing about save for seeing them on the site. The names are so similar it is hard to keep them straight, but I’ve loved all the concentrations of For Her so will likely try these, too. NR is just the worst about names…I can hardly keep the line straight. I have a hard time with the names, too, and the fact that the bottles are only ever so slightly different doesn’t help, either. That said, this one sounds so intriguing–fig! I can’t wait to test it. The new one has a much stronger patchouli note that’s apparent even at the top, the type of patchouli that’s pretty ubiquitous in dept. store fragrances. More patchouli sounds wonderful to me, even if it is the somewhat cleaned up patch in most new dept. store frags. I’d like to try that one–the NR For Her In Color I mean, as well as the new one. They just need to do something about the ridiculously similar product design. It is very confusing to keep all the concentrations straight. I adore the original For Her. This one is a must-try. All these NR fragrances are named and labeled terribly! On top of that, the EDT comes in a black bottle in a pink box and the EDP bottle comes in the same pink and a black box. Great line, but seems deliberately confusing! It’s like they don’t care if they confuse their customers. Frequently, even SAs are not able to explain how the fragrances differ from each other. The ones that don’t know there I would assume are new or they just shouldn’t be there. Considering I represent this line, I make sure I know the fragrances inside and out. Nothing worse than misinformation or someone who is there serving you for a pay check. I had no idea that the original EDT was supposed to contain osmanthus … I wore it for a couple of years and never got that. Perhaps the NR marketing folks have gotten their own fragrances confused? It’d be understandable. And supposedly, despite the description above, osmanthus is included in the pyramid for this new one too. I enjoy the NR line but hate the confusing names! This one will certainly be worth a sniff. NR For Her Musc Intense (which isn’t really intese at all) is a winter time staple for me. Yes! For Her Intense is very subtle and very beautiful.